The West Virginia Division of Culture and History (WVDCH) is announcing a call for entries for a juried art exhibition with the theme “West Virginia Wildlife” at the Culture Center, State Capitol Complex in Charleston. The show will be the third of four in the Inspired: A West Virginia Series of Juried Exhibitions presented by the Division. The exhibition will open Aug. 8, 2011, in the Commissioner’s Gallery of the West Virginia State Museum. The Inspired series of exhibitions was conceived by Commissioner Randall Reid-Smith of the WVDCH as a way to commemorate the Mountain State’s sesquicentennial, which culminates in 2013. The series harkens back to the museum’s early days, when artists were asked to focus on a specific theme to help increase the size of the state’s art collection. 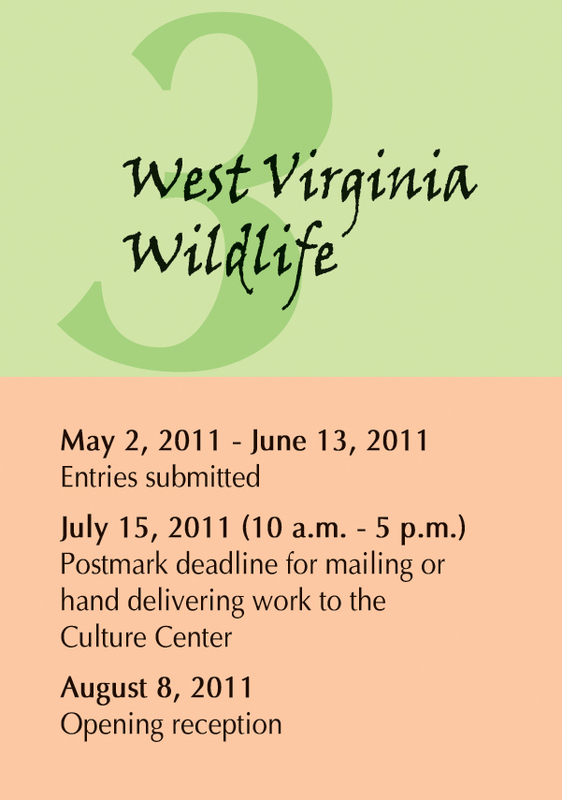 The exhibition is open to all West Virginia artists whose wildlife submissions can be hung from a wall. Eligible entries include works created in the last two years in the areas of painting, printmaking, drawing, photography, mixed media and crafts/wall hanging.